Artificial Intelligence (AI) is the capability of a machine to achieve cognitive functions that are usually associated with people. These cognitive functions include perception, problem-solving, learning, reasoning, environmental interactions, and creativity. The convergence of several technologies including big data, algorithmic advancements, and improvement in computer hardware have led to the growth of AI from hype to reality, and in becoming a useful part of business today. 65% of companies will build their own applications using cloud-based development services. 83% of companies will have adopted cloud-based AI platforms. AI has specifically benefited B2B sales and B2B marketing in terms of personalization and efficiency. 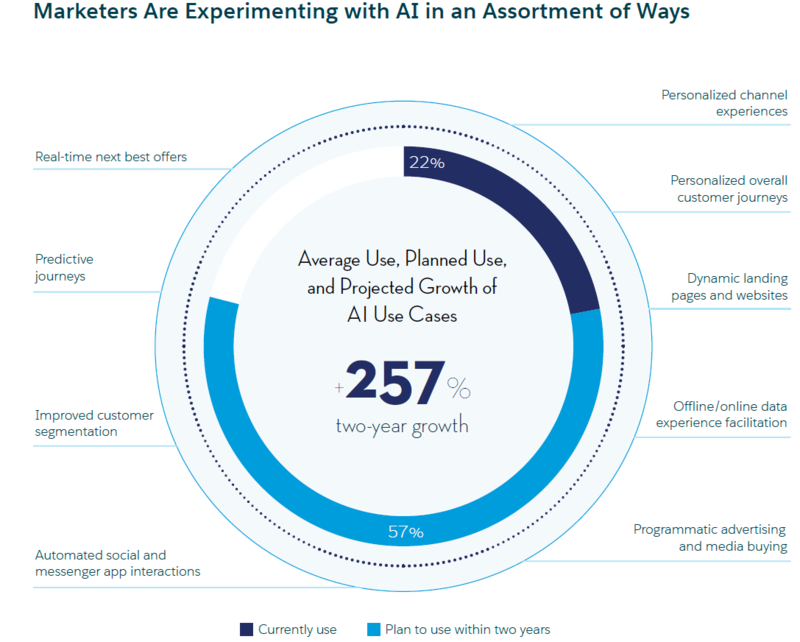 For example, 64% of marketers that are already using AI state that it has significantly increased their overall marketing efficiency. As for personalization, 57% of marketers say that AI is critical for creating one-to-one marketing across all touchpoints. How AI Can Rank Up B2B Sales Today? Below are a few of the specific ways that AI can help you improve your B2B sales. Big data and AI are used by sales managers to predict sales numbers for each member of their sales team and therefore forecast total revenue with high accuracy. The sales forecasts are also useful from an operations perspective when it comes to managing inventory and resources. An AI algorithm can be used to pick the perfect discount rate to ensure that the likelihood of closing the deal is optimized. Some of the factors that are used to determine the optimal discount include price history of successful sales (and lost deals), product specification compliance, number of competitors, etc. Lead scoring is useful for making decisions on where to focus attention so that a salesperson can reach their monthly or quarterly quota. Without AI, sales people have to rely on gut instinct or incomplete information simply because there is too much of it to process. With AI, the more the data used, the better and more accurate the results. Everything from historical data to social media and text messages can be used to rank leads and therefore increase the likelihood of successfully closing a deal. AI is used to generate insights about the salespeople that are most likely to reach their sales quotas in real-time. This allows sales managers to step in and provide leadership that can make the right impact on a salesperson to help them achieve their quota and in turn help the company generate more revenue. Salespeople can also guide themselves towards better deals by prioritizing prospects or leads that have the highest likelihood of making a purchase. Cross-selling and upselling are the fastest and most economical methods to grow top-line revenue. However, determining who is most likely to purchase more can be a challenge. Without AI, salespeople are left with little option but to blindly market and waste resources on customers who may or may not buy. By using AI, you can determine which of your customers has the highest probability of purchasing more (upsell) or which customers will need or prefer a different product (cross-sell). In the least, by using AI, salespeople can optimize how much they spend to market to their customers. At best, they will spend the least amount with maximum impact. How AI Can Rank Up B2B Marketing Today? Below are a few of the specific ways that AI can help you improve B2B marketing. 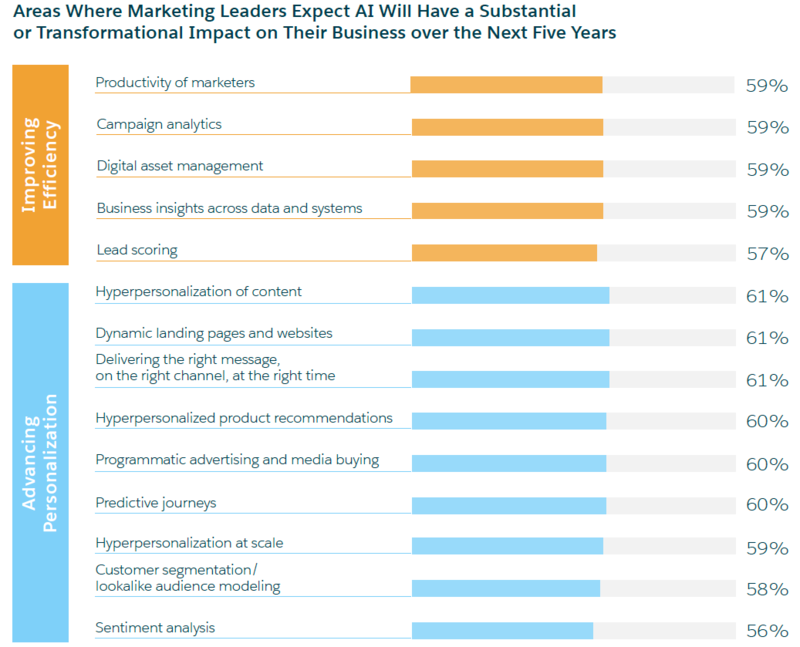 AI and more specifically, machine learning and predictive analytics, are proficiently used by B2B marketers to acquire more customers through lead generation and lead scoring. Additionally, AI is used in programmatic advertising and marketing project/program measurement which are all useful for campaign optimization. AI systems are valuable for crunching and parsing big data from disparate sources including from DMPs (data management platforms), data lakes, data warehouses and other repositories with unstructured or structured data. The AI can then join the dots in the data, find relationships and make predictions that a person with limited resources and high pressure to perform at the highest levels may never be able to achieve. 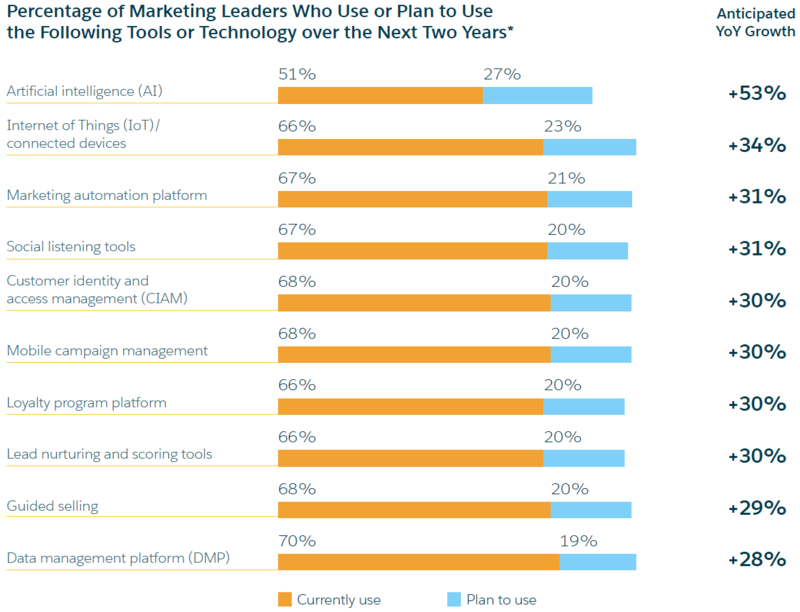 B2B marketers are using these AI capabilities to enhance market research, business intelligence and forecasting accuracy. AI is used to uncover insights related to brand positioning by analyzing data from multiple channels. B2B marketers can, therefore, tailor their marketing campaigns to reinforce or amplify their brand message. AI systems are being used to generate on-demand advertisements, article summaries, and other published content based on analytics and other data inputs. Additionally, AI is being used to improve the content that is used in marketing automation. Companies that foster AI for their sales and marketing needs are prone to some challenges that could potentially prevent them from smoothly implementing AI or worse yet ever benefitting from AI at all. In fact, a Salesforce survey conducted in 2017 showed that 74% of business leaders (including sales and marketing leaders) were not confident in their organization’s ability to define an AI strategy. Avoid the hype and choose partners wisely, by doing your due diligence and ensure that you select a partner that not only says what they can do but proves that they can do it as well. You can engage in a pilot project before jumping in with both feet. Bring together AI and people’s needs. By understanding the needs of stakeholders, and by bringing together AI and people, you will produce the best outcomes. For example, get people to assess a problem and choose the data that will solve the problem and then use AI to automate the process. Be ethical and transparent. Your stakeholders and especially your customers will be loyal to you if you are ethical and transparent. If you are not, then you will soon lose your following. By adopting the above best practices, you will get the most out of AI adoption and therefore seamlessly rank up your B2B sales and marketing.